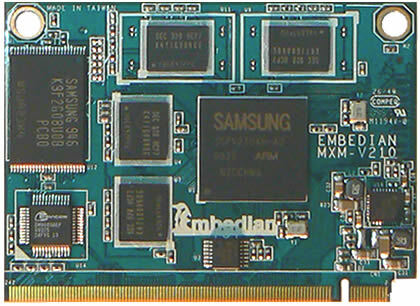 MXM-V210 Computer-on-Modules based on Samsung S5PV210 ARM Cortex-A8 technology clocking at 1GHz with multimedia co-processor (MFC) that supports encoding and decoding of MPEG4/H.263/H.264 and decoding of VC1 and Divx. MXM-V210 features state of the art technology, aiming at low power systems that require higher CPU performance. It also provides with all the interfaces needed in a modern embedded device. The small form factor makes system integrators and manufacturers flexible in designing their products and make them fast time to market. It can be applied to the general-purposed embedded application or multimedia-related embedded application by taking advantages of the MFC co-processor.